More than 60,000 people are estimated to have attended Lewes Bonfire last night, with about 33,000 travelling to the event by train. Two people suffered serious head injuries and 22 people were taken to hospital. South East Coast Ambulance Service and St John Ambulance treated 170 people, mostly for minor injuries. Fifteen people were arrested, mostly for drunken behaviour, minor assaults and having drugs. Sussex Police said that the number of arrests was about half of last year’s total with no serious incidents of violence or disorder. East Sussex Fire and Rescue Service reported a quiet night in the area, dealing with about a dozen small fires which were quickly put out. Superintendent Tony Blaker, the senior police officer for the night, said: “The Lewes Bonfire continues to be an incredibly popular event and it would appear that many more people attended this year’s event compared to last year. “This may have been due to the dry weather and the event falling on a Saturday night. “At public events of this size there is always going to be incidents of criminal activity and anti-social behaviour. “Unfortunately we saw a large number of firework-related injuries in the street despite appeals for people not to bring them. “This year was the first time that plain-clothed officers were used to help police the event and as a direct result a number of fireworks were confiscated and arrests made. “The policing of this event involves months of preparation, planning and consultation with the bonfire societies, councils, East Sussex Fire and Rescue and British Transport Police, with the main aim being to provide a safe environment for the participants and spectators on the night. 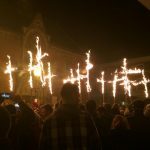 Chief Superintendent Robin Smith, the East Sussex Divisional Commander for Sussex Police, said: “Once again people have attended in their thousands to line the streets and take part in the Lewes bonfire celebrations.